My husband Kim is an amazing cook. I used to do all the cooking but now that he’s around, I do a lot less and focus on “ooohing” and “aaahing” over the amazing things he makes, plus doing the prep work (i’m a great veggie chopper) and washing the dishes afterwards. I’m much more of a computer nerd and am in charge of keeping our websites updated, answering emails from prospective Amigas, and keeping up to date on social happenings on facebook. Fortunately, I’ve got an awesome husband to make breakfast while I slog it out in front of the computer screen. While trying to lessen our allergies, we started avoiding gluten almost a year ago and have noticed a big difference. I notice the difference especially now when I do eat gluten. A few slices of pizza on a traditional wheat crust will leave me feeling lethargic and yucky. We make pizza on thick corn tortillas, eat a lot of rice instead of pasta, and recently have been experimenting with corn (masa) and almond flours. You can’t get almond flour in Nicaragua, but we have awesome friends who have been bringing us bags of it. We’ve also been reading a lot about cacao aka chocolate which is readily available and abundant in Nicaragua. This book talks all about the medicinal properties of raw (and even cooked) cacao and will erase any guilt you might feel about eating chocolate! We also happened to score a couple baskets of blackberries (which unfortunately aren’t available locally) from the Pricesmart (think Costco) in Managua. Add that to the abundance of coconuts falling from trees nearby and you’ve got a delicious mixture of local and distant ingredients, but all gluten free! We don’t have an oven so we poured all this into a greased (with coconut oil) cast iron pan and cooked on the stovetop over medium heat for about 30 minutes or until it seemed done. You can definitely use an oven, but you’d have to figure out the temp and timing. For the topping, stir together a handful of blackberries, a few spoonfuls of sugar, some cinnamon, and chile powder then cook on the stove top until it seems nice and saucy! 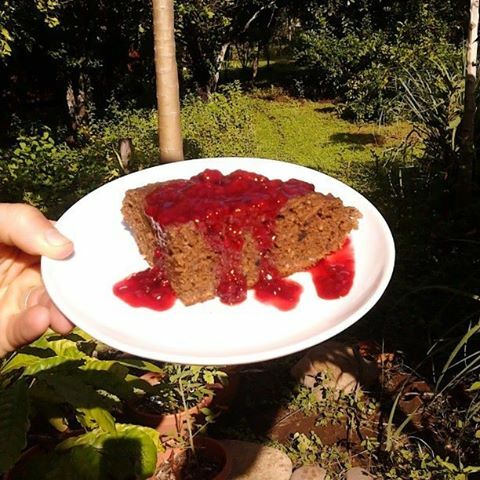 This entry was posted in Eat drink and be merry and tagged almond flour, blackberry, cacao, cake, coconut, compote, gluten free, holly beck, kim obermeyer, masa, nicaragua, recipe. Bookmark the permalink. Check us out at http://www.aquagardensfamilyfarm.com and on face book. We are 100% organic, aquaponic farm in Nor Cal, working on permaculture at every turn. We plan on traveling (surfing) and showing developing countries how easy this is.